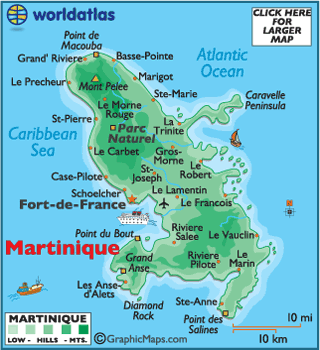 A geographical location, Map of Martinique. 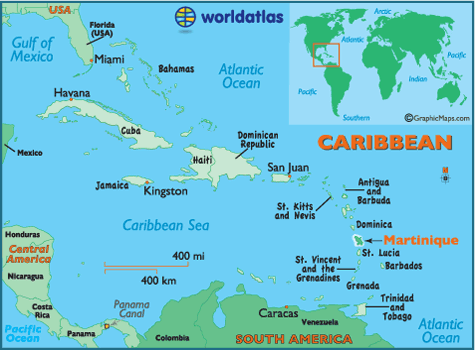 With is 1100 Km², the french island is a volcanic isle, located between Dominique in north and Sainte Lucie in south (between the Cancer tropic and Equator, in central america), separate respectively by two canals : Dominique canal in north and Sainte Lucie canal in south. Martinique is situate about 7000 km from Paris. The diversity of the climate, of the relief and of the vegetation demonstrate the originality of the landscape of « Flower island ». Located at 14,40° of north latitude, at 61° of west longitude, Martinique benefit from a tropical climate of type insular hot and humid; Two factors affect the island climate : the Acores anticyclone which direct Alizes (a noth-east wind, and the intertropical concurent area, where Alizes converge with south-east winds of the Atlantic south. The median temperature is about 26°C.